It’s been many years since I re-fretted a guitar. I replaced the frets in my PRS with taller frets. It’s a $200 guitar so I couldn’t justify a $300 fret job. I had the tools and it’s a labor intensive effort but it came out nice. I’ll finish the setup this week. There is something very satisfying about doing your own fret and nut work. And the cost has made outsourcing almost prohibitive, no matter how much your guitars are worth. 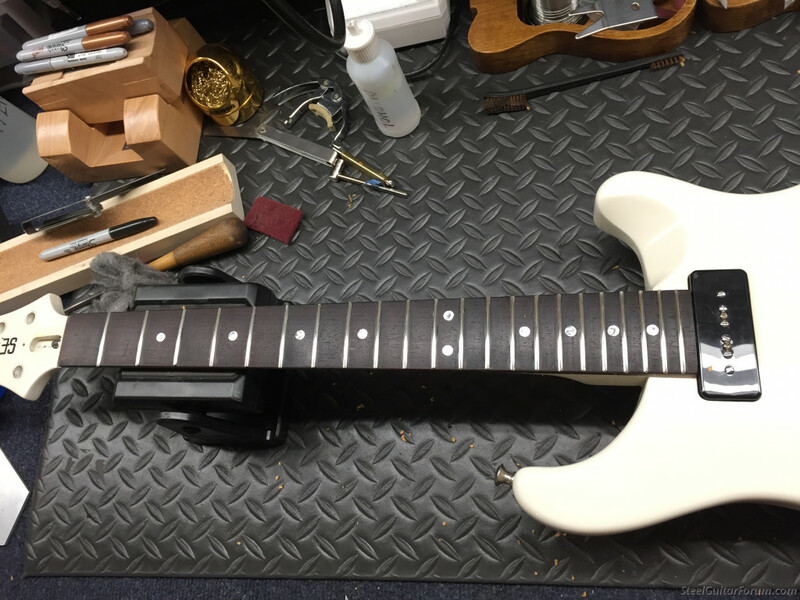 A neck with no binding certainly makes the job more DIY-friendly. I do my own fret leveling, nuts and re-crowning on every guitar I buy. Like to get the high E string in the 0.042" - 0.060" range at the 12th fret with no buzzing. I really need to to get the Stewart-Mack neck jig to hone my efforts. Always wanted to try the Pleck system on one guitar at least. Sweetwater offers the Pleck for $200 when you buy the guitar from them. The last guitar I worked on had stainless steel frets and it was all I could do to get enough pressure with the files to get them to cut down. Your fret job looks great and the jumbo frets seem to be the big thing now on guitars and mandolins. range so I decided to tackle it myself. If you have the tools and take your time it can be a fun project. I watched some youtube videos from Highline guitars on precut semi-spherical end shaping. I suggest anyone trying to refret a guitar to practice on a cheap beater guitar to practice.